Hello to all of you out in Blog Land! Can you believe it's Wednesday already? I can't!!! It seems like this week has just flown by so quickly. If you're joining me on a Wednesday for the first time and wondering why I'm showing you pictures of my work space, take a moment (after you finish reading my post of course) to check out WOYWW at Stamping Ground to find out all the lovely details. And of course, be nosy and have a peek at other's desks! So back to my desk. As you can see there is a little mess going on. 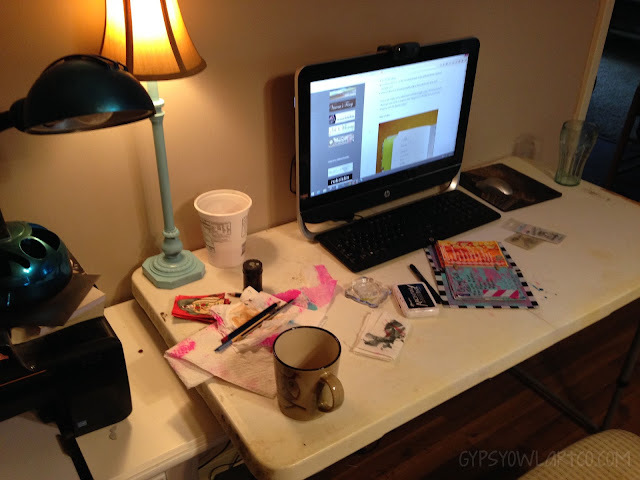 Let me stop right here for a quick second and explain why my desk is usually pretty mess free on Wednesdays. I have a young art student who comes on Tuesday's at five. So whatever mess I have out has to be cleaned up by the time she comes or she gets very distracted by what I'm doing or the supplies rather than her lesson. After she leaves it's Supper and Family time. I usually get back to working on a little something after that but it usually leaves a small imprint. If I can make myself start journaling again then I'm sure I will start making much more of a mess! Anyway... back to the desk. As you can see, there are twelve new pots of paint sitting there! I finally got to order the new Dylusions paint and they came yesterday!!! Aren't they pretty?!?!?!?!?! I also got the four stencils in the same order. My hubby ordered the Dymo Hand Label Maker you can see pictured for himself, but since he only wanted it to label exactly one thing it became part of my stash! I told him when he ordered it that I'd always wanted a label maker! 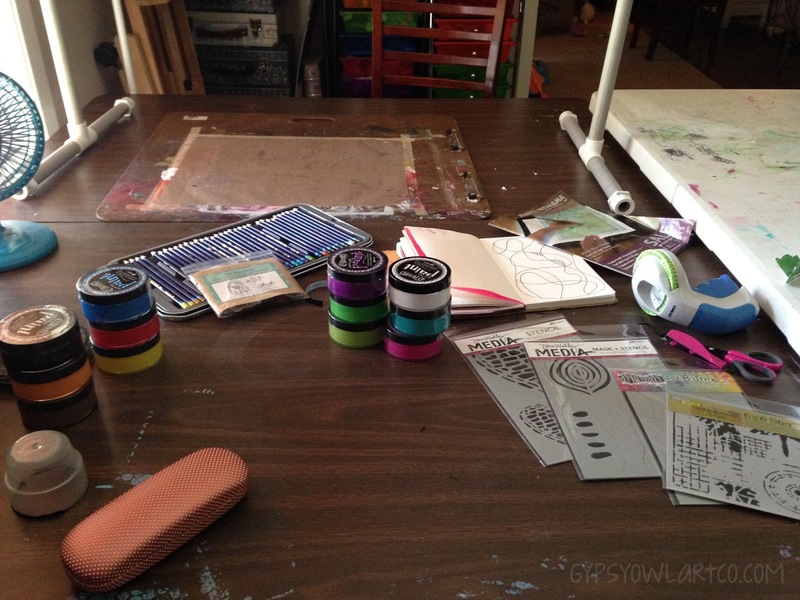 The small art journal you can see is part of my lesson from yesterday that I haven't put away. We're working on lines and what better way to learn about lines and patterns than a little zentangle? You can also see my tin of Inktense pencils which is missing quite a few pencils and a stamp from Unity Stamp Co.
Yep! It's a two-for-one kind of desk day! I'm working on a set of ATCs (pictured below the lamp) using my Inktense pencils - found the missing ones! And of course I'm multi-tasking and doing my daily 30 Days of Lists prompt for today and yesterday... can't believe I missed yesterday's list but then again it was my oldest's birthday and we were busy. So that's what I've got going on! Be sure to hop over to Julia's and check out the other deskers. Y'all have a great week and I'll see you next Wednesday! Oh - love seeing the same paints and pencils I have! It is not nearly as messy as my desk though. I am loving stencils right now. Looks like lots of fun.